This data product, now at version 2, is a blend of digital elevation model (DEM/DTM) data derived from the Mars Orbiter Laser Altimeter (MOLA), an instrument aboard NASA’s Mars Global Surveyor spacecraft (MGS), and the High-Resolution Stereo Camera (HRSC), an instrument aboard the European Space Agency’s Mars Express spacecraft. This was created in support of thermal modelling studies and product creation for Mars (Ferguson 2017; Laura 2016). MOLA fired infrared laser pulses downward 10 times per second, and measured the time it took for the reflected pulses to return from the surface. The image used for the MOLA base of this map represents more than 600 million measurements gathered between 1999 and 2001. The average accuracy of each point is originally ~100 meters in horizontal position and the total elevation uncertainty is at least ±3 m. MOLA produced global topographic coverage with a spatial resolution of about 300 x 1000 m at the equator, and better near the poles. HRSC, the only dedicated stereo camera orbiting Mars, is a multi-sensor push broom instrument comprising 9 CCD line sensors mounted in parallel for simultaneous high-resolution stereo, multicolor and multi-phase imaging by delivering 9 superimposed image swaths. The HRSC design permits stereo imaging with triple to quintuple panchromatic along-track stereo including a nadir-directed, forward and aft-looking (+/-18.91), and 2 inner (+/-12.81) stereo line sensors. The along-track acquisition of stereo imagery avoids changes in atmospheric and illumination conditions. The sub-pixel accuracy of the three-dimensional point determination allows the derivation of digital elevation models DEMs with a grid size of up to 50 m and a height accuracy of a single pixel with up to 10 m.
Fergason, R. L., P. R. Christensen, and H. H. Kieffer, 2006, High-resolution thermal inertia derived from the Thermal Emission Imaging System (THEMIS): Thermal model and applications, J. Geophys. Res.,111(E12004), doi:10.1029/2006JE002735. Jaumann, R., et al., 2007,, The high-resolution stereo camera (HRSC) experiment on Mars Express: instrument aspects and experiment conduct from interplanetary cruise through the nominal mission, Planet. Space Sci., 55 (7–8), pp. 928-952. Neukum, G., Jaumann, R., and the HRSC Co-Investigator and Experiment Team, HRSC: The High Resolution Stereo Camera of Mars Express, in Mars Express: The scientific payload, edited by A. Wilson, pp. 17-35, ESA, Noordwijk, The Netherlands, 2004. Neumann, G. A., D. E. Smith, and M. T. Zuber, Two Mars years of clouds detected by the Mars Orbiter Laser Altimeter,J. Geophys. Res., 108(E4), 5023, doi:10.1029/2002JE001849, 2003. Smith, D.E., Zuber, M.T., Frey, H.V., Garvin, J.B., Head, J.W., Muhleman, D.O.,Pettengill, G.H., Phillips, R.J., Solomon, S.C., Zwally, H.J., Banerdt, W.B., Duxbury, T.C., Golombek, M.P., Lemoine, F.G., Neumann, G.A., Rowlands,D.D., Aharonson, Oded, Ford, P.G., Ivanov, A.B., Johnson, C.L., McGovern,P.J., Abshire, J.B., Afzal, R.S., and Sun, Xiaoli, 2001, Mars Orbiter LaserAltimeter—Experiment summary after the first year of global mapping ofMars: Journal of Geophysical Research, v. 106, no. E10, p. 23,689–23,722. This interim (v2) DEM was created to help fill gaps in MOLA with the HRSC DEM. The initial use case is to help with thermal modelling (Ferguson 2017; Laura 2016). There are areas where the blending of the HRSC on top of MOLA did not always work well. Care should be taken when using for scientific analysis. The average accuracy of each point is originally ~100 meters in horizontal position and ~1 meter in radius (Neumann and others, 2001). However, the total elevation uncertainty is at least ±3 m due to the global error in the areoid (±1.8 meters) and regional uncertainties in its shape (G.A. Neumann, written commun., 2002). The MOLA data were initially referenced to an internally consistent inertial coordinate system, derived from tracking of the MGS spacecraft. These values include the orientation of the north pole of Mars (including the effects of precession), the rotation rate of Mars, and a value for W0 of 176.630°, where W0 is the angle along the equator to the east, between the 0° meridian and the equator’s intersection with the celestial equator at the standard epoch J2000.0 (Seidelmann and others, 2002). This value of W0 was chosen in order to place the 0° meridian through the center of the small (~500 m) crater Airy-0, within the crater Airy. Longitude increases to the east and latitude is planetocentric as allowed by IAU/IAG standards and in accordance with current NASA and USGS standards. This was completed using HRSC DEMs released 2017 or earlier (through HRSC DEM h7500_0000.da4.tif). The HRSC Team is re-working all HRSC DEMs and this product will eventually be superseded. Two HRSC DEMs were removed due to larger than normal height differences (h0938_0000 and h0927_0000). Several DEMS (~10 in total), were slightly crop to help create a more consistent edge blend into MOLA. HRSC DEMs used in this product now covers 44% of Mars. 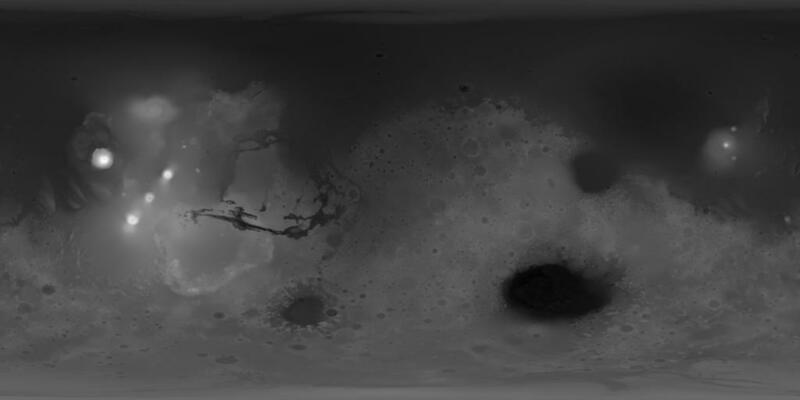 This blend was accomplished by taking the full-res (463m/p) MOLA DEM and blending the high-res HRSC DEMs (~50m/p) into it. The HRSC DEMs required a re-projection from their original Sinusoidal projection into Simple Cylindrical. A cell-size of 200m/p was chosen as a compromise between up-sampling the MOLA and down-sampling the HRSC DEMs. Both up-sampling (MOLA) and down-sampling (HRSC) used a bilinear interpolation. Blending distance across the HRSC edge (into MOLA) was 5km (100 pixels) to ensure a smooth transition.